Size: 6x6cm slide & 135 B&W negs. Caption: It was about noon in this Saturday or Sunday morning at the 1983 Paris-Le Bourget Air Show, alone at the opposite of arriving spectators for the show, I closely examined and turned around the formidable 1912 streamlined Deperdussin racer which was first to break the then mythic 2OO km/h speed record linked to the Gordon Bennett Trophy and I smiled when seeing that its two struts fitting upper cables to maintain wings were fully comparable, seventy years later, to the fore ones installed at top 747's fuselage to maintain Endeavour... and seemed ready to go and bear the 747 mothership!!!! Suddenly appeared, behind the shuttle demonstrator, a more than century vision: a Montgolfière. You have here the astonishing result which is, according my archives, the Century picture I have. 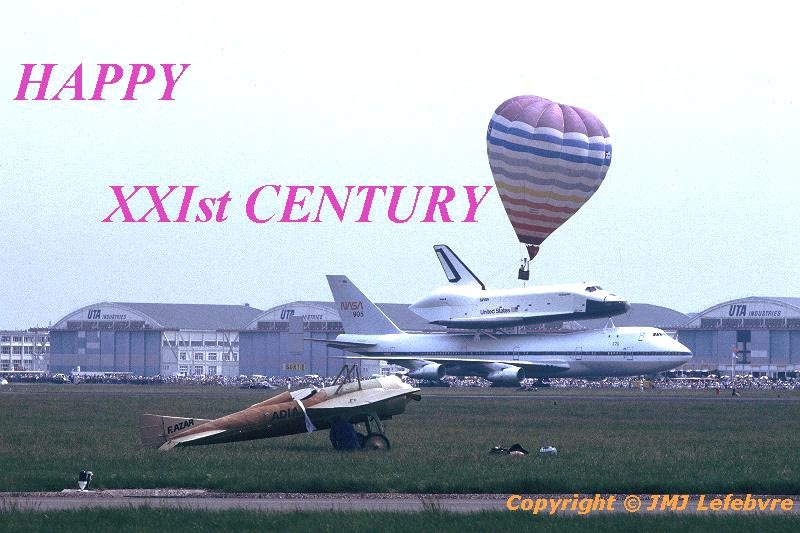 I believe this an excellent augury and so wish to every one of you the Best for XXIst Century and remain alive as far as possible to surely see as so astonishing things, if not more, to appear as during the previous era, Aerospacely speaking. Content of this Number One of Aircraft Pictorial International also corresponds to the first official report I did for the Aviation Press. It was 1972 and when taking the first picture, I ignored that it was the beginning of the end concerning my then specialized studies of the whole Luftwaffe organisation inside the Third Reich Army and derivative papers about uncommon german aircraft as Dornier Do 335, Arado Ar 240, Blohm und Voss Bv 141, Heinkel He 162 and the Gigant Me 321 and 323 transport glider and aircraft from Messerschmitt and the hilarious Klagenfurt Klf 355 I invented with my friend Francis Bergese, the well-known drawer and scenarist continuating, since several years, the famous military aviation comics series " Buck Danny " ranging from the Japanese attack of 1941 to present military aviation situations involving Russians or others. I also was fascinated by the Opus of Claudius Dornier beginning his carreer with the invention of the metal triangular strut as a basis for inside structures of Zeppelins and so I wrote four papers about this concept applied to his first aircraf, in fact four giant flying-boats, the RiesenSeeFlugzeugen Rs-I to IV evolved during WWI. You see here the result of a fascinating visit to the Istres Air Base, very near Marseilles in southern France, housing then a strategic squadron of Mirage IV A nuclear bombers and its parent refuelling squadron of C-135Fs, the mythic French Centre d'Essais en Vol ( CEV ) otherly said Flight Test Center and its annex, the Ecole du Personnel Navigant d'Essais et de Reception ( EPNER ) otherly said the Flying Test and Reception Crew's School, being one of the best in the world with pupils coming from many countries involved with tests of indigenous aircraft prototypes and reception of production aircraft, military or civil. I just add, beside construction of easier navigation means inside the Pictorial, that you have to see for possibly a long time black and white pictures; naturally, the day I get all my slides, they were almost the same as B&W, I stop this chronology to publish them, before to continue it under a mixed form or under alternated period to avoid instant twins of b&w and slides.